Hon-Atsugi Wormhole - Martin's Garage n.a. Can you find Paul Gregan? Great British Dishes: Let's Eat! Famous Japanese Stuff in English, by Students ! This is my funny story about a book. What book? This one! But... the story starts with the film of the book. It was released in 1997. At that time, I was working in a private English school, not at university. 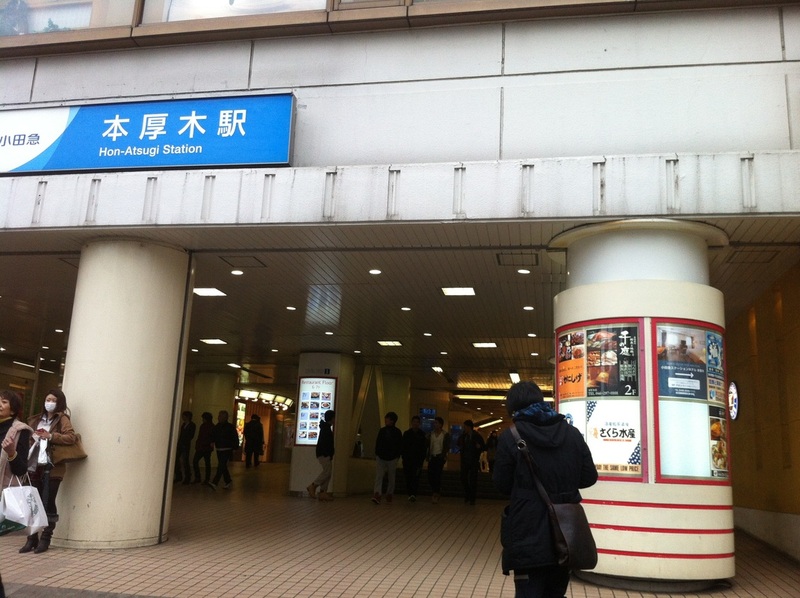 It was located in Hon-Atsugi. I heard about this new film, and I thought it sounded interesting. 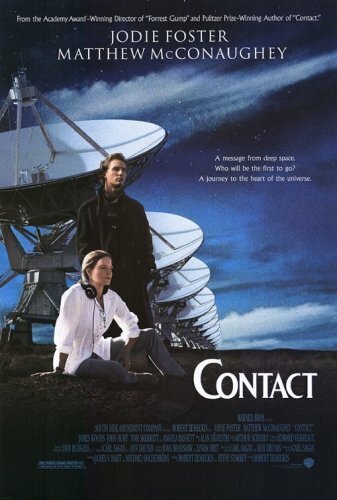 During lunchtime on a Friday I was told by a fellow (great) teacher, Dionne, that the film was based on a book. By Carl Sagan, the great scientist, whose TV programme 'Cosmos' I loved watching when I was younger. As I heard this, I thought: 'I want to see this film! But..... before I see the film, I MUST READ THE BOOK!!!!' This, I decided, became my new, sudden mission. I REALLY wanted to read this book as soon as possible. BUT..... the film opened soon and now it was Friday, so I wouldn't be able to come back to this town until Monday in order to buy the book. AND LUNCHTIME HAD JUST FINISHED!!!! Have you ever had a situation like that? Where you really wanted to get something and would stop at nothing in order to get it? Well, that's how it was for me. 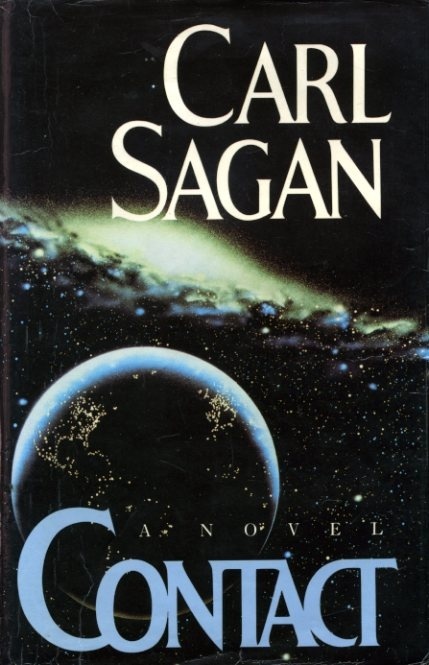 I needed to buy this Carl Sagan book. Immediately! So, I decided on my plan. So, immediately my class finished, I ran. I can't remember if I took the stairs or the elevator but I had to take one of them, because the school was on the third floor and I didn't want to jump out of the window! 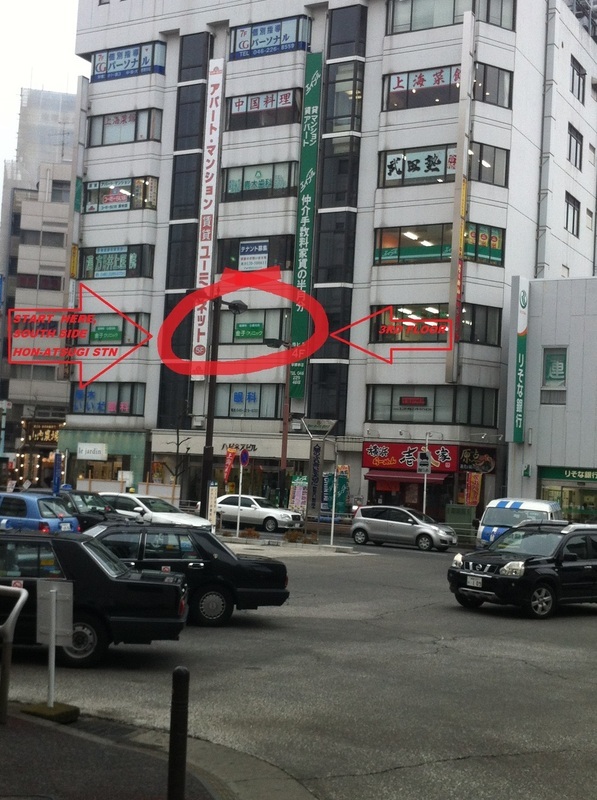 Here below you can see the building where the school was, on the south side of Hon-Atsugi Station (Kanagawa-ken), the station is on the Odakyu Line, and goes between Shinjuku and Odawara. Then I got onto the street in front of the building and went to the right side and made my way past the taxis, going to the entrance of Hon-Atsugi Station. I had to check for traffic, too. The other day (talking 2015), I checked this route. At a brisk-ish walk, it took me ONE MINUTE AND EIGHT SECONDS from outside the school building to the entrance of the station. I presume it took at least THIRTY SECONDS to get from the third floor to the street. I presume I didn't really run like crazy all those years ago, as that would look strange. 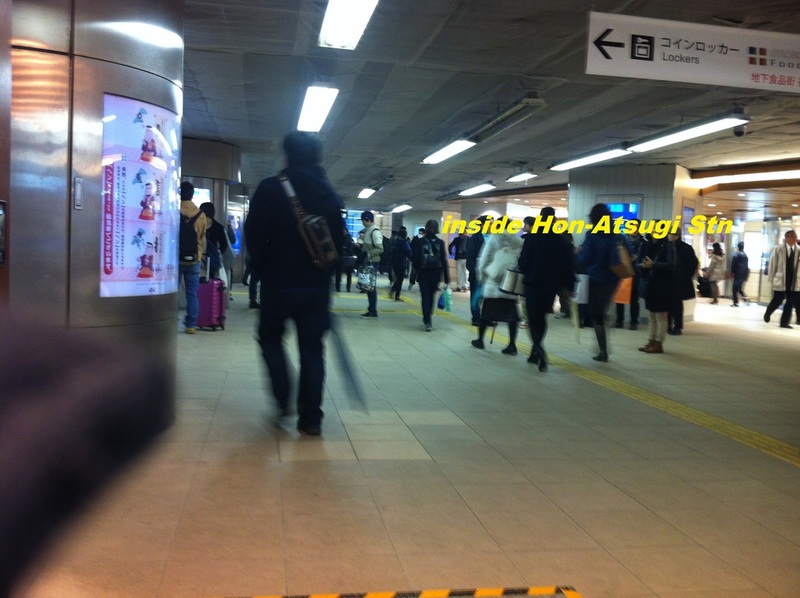 Below is Hon-Atsugi Station inside. The other day, walking briskly, I walked from the South entrance to the North Exit and it took me exactly FORTY FOUR SECONDS. Now, let's see the view from the North Exit. The red line shows the path from the Exit towards the main street. 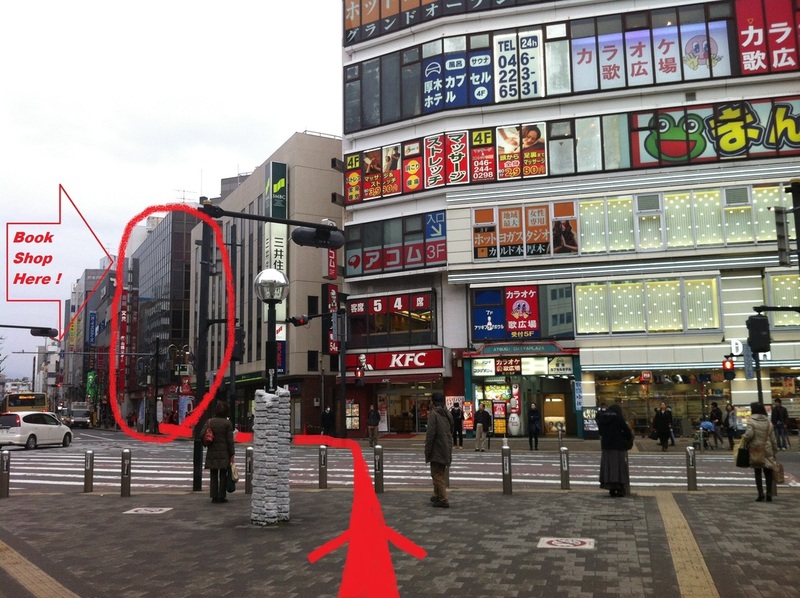 The next pic below shows the view taken from the end-point of the arrow, looking left-wise, which is where the bookshop is. Follow the red line and that takes you to the bookshop. As you can see, there is a wide road, and usually pedestrians have to wait, depending on the traffic. I don't remember if I had to wait in 1997, but likely I did, at least crossing over or back. The other day, however, I was lucky to not have to wait. So, anyway, cross over the street, and walk down a little bit and there you are at the bookshop, see below. Yurindo Bookshop, Hon-Atsugi. A great place to spend an hour or two. ! But I didn't have that long on that day in 1997. I had only a few minutes to get in, up and buy the book. OK. 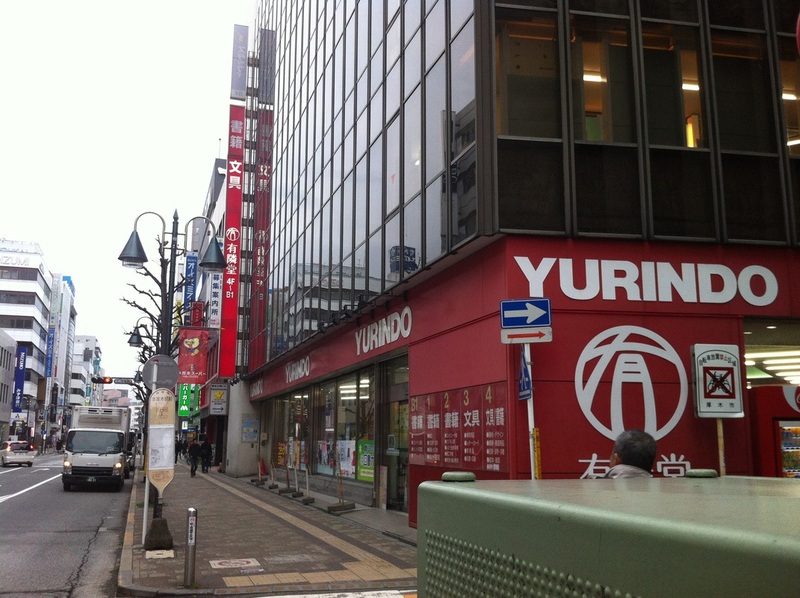 So, just the other day, I timed myself from the front of the school building on the south side of the station to the outside of the Yurindo bookshop on the north side of the station. I was walking briskly and I had NO traffic waiting time at all. It took me exactly TWO MINUTES AND FIFTY SIX SECONDS. Okey dokey, so what's all this about??????? Well, what it's all about is that -in 1997- I still had to enter the bookshop, take the escalator up to the second floor, then make my way through the length of the shop and take the stairs to the third floor, be told then (after asking at the counter) that there was some renovation works and all English books were on the fourth floor, run up to the fourth floor, and then start looking for the book! That must have taken some time, as I didn't really know any of this before I entered and had to just look blindly around to find the right section. But, I did find the book!! Then, I left the bookshop, re-tracing my steps down and out and onto the street and back the way I had come, putting up with whatever traffic I had to. And I made it back to my school just as the bell for the next class was ringing. I sat down in the classroom with my students and they asked me why I was looking so tired. I told them. I showed them the book I had bought. I had gone there and back in EXACTLY TEN MINUTES. All of this is funny, of course, if you know the book or the film. The main character, Ellie, gets the chance to ride in a kind of spaceship through a wormhole in space. She travels to a different galaxy, and in the twinkling of an eye. and in the film. It's kind of amazing, actually. 30 seconds PLUS 2 minutes fifty six seconds PLUS about two minutes and probably more like three, just to buy the book.... that comes to FIVE (OR SIX) MINUTES TWENTY FOUR SECONDS. And that calculation is based on having ZERO TRAFFIC PROBLEMS, which is highly unusual. Often we have to wait two minutes plus to cross that road near the bookshop. If we add, say, conservatively, two minutes, based on only a one-way traffic hold-up, we're looking at either SEVEN or EIGHT MINUTES TWENTY FOUR SECONDS JUST TO BUY THE BOOK !!! THEN I HAVE TO GO BACK TO THE SCHOOL !!!!!!!!!!!!!!!!!!! ALL INSIDE TEN MINUTES !!!!!!!!!!!!!!!!!!!! I don't know. 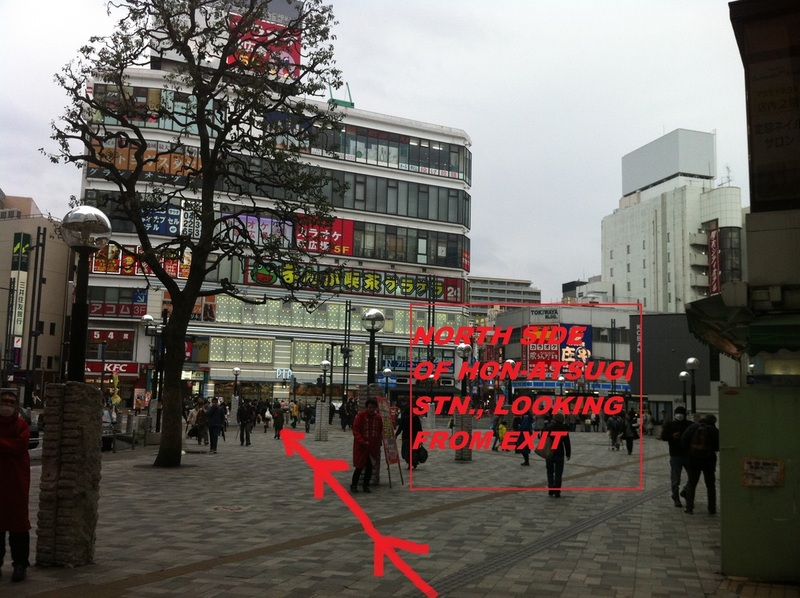 Maybe there is a wormhole in Hon-Atsugi. And maybe I flew through it. it can take you there too. Just buy and read the goddamned thing! HAPPY READING & WATCHING EVERYONE !!!!!!!!!!!!!! Travel through a wormhole to a bookshop near you.... and then buy a book, open it, and travel through a different kind of wormhole altogether!